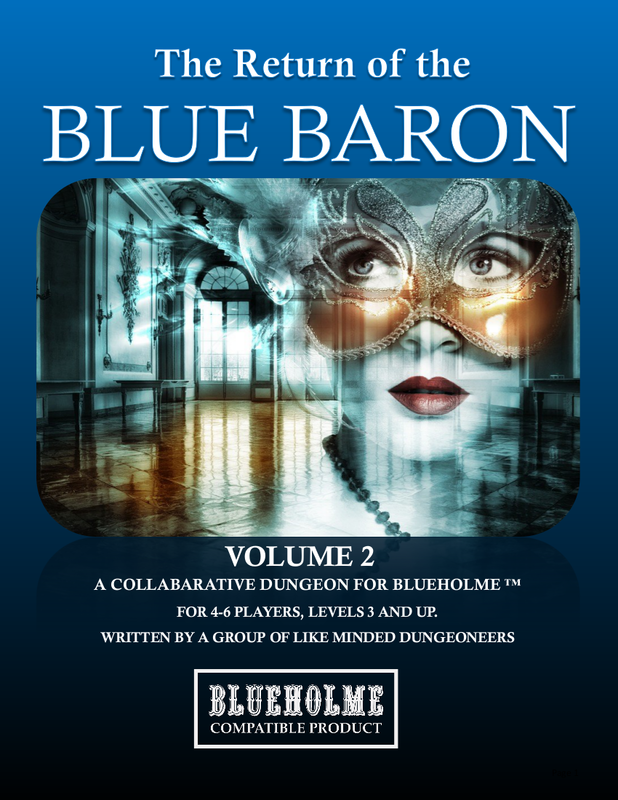 Welcome to "The Return Of The Blue Baron" Volume 2 in the "Blue Baron" Series of Collaborative Dungeons. It is with heavy heart that I confirm the rumors which you must have heard by now. My husband, Lord Gavanov Keiner, 23rd Baron Keiner, known to many as the Blue Baron, is no more. A collabarative dungeon for Blueholme Prentice & Journeymann Rules, for 4-6 players levels 3 and up. Please note: A POD version of this will be released soon. It will be at cost. As well a black & white printer friendly no art pdf will also be released. We appreciate any feedback, reviews and errata information that you can provide. Thank you very much! We want to know about your experiences with "The return of the blue baron!" Which conclusion did the adventurers play out? If it was Bested, how did the adventurers escape the dungeon? Labels: the return of the blue baron.